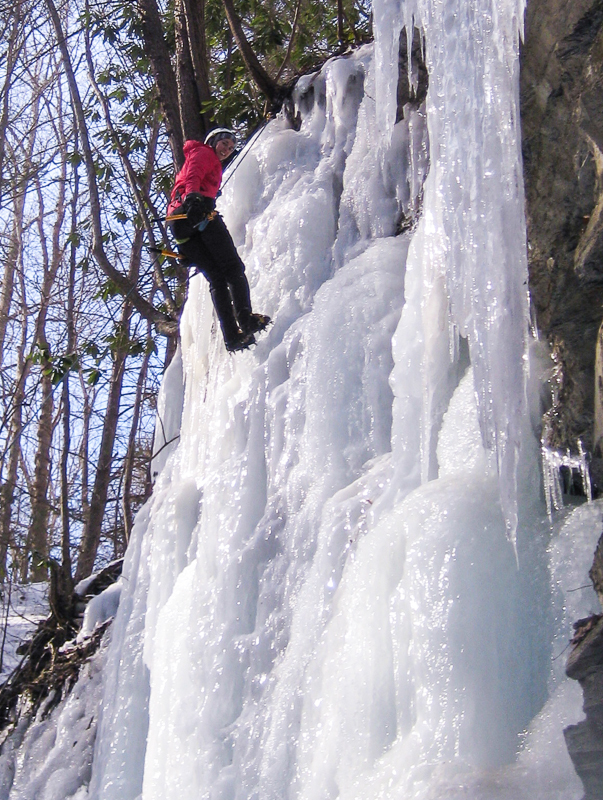 I was a little bummed I didn’t get to go ice climbing in New Hampshire a few weeks ago so I did a little googling and found a place that teaches it closer to home. 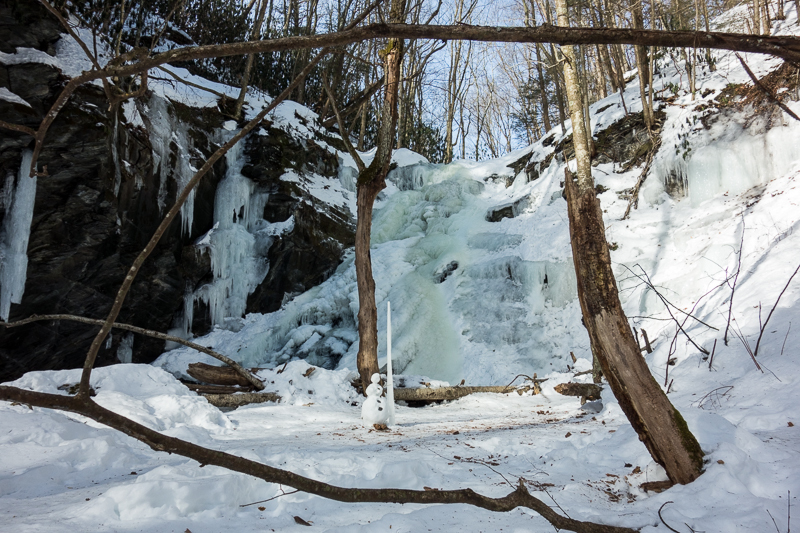 I rounded up a group of other adventurous people and off we went to the Delaware Water Gap this morning to meet up with Northeast Mountain Guiding. There was an even larger group waiting, and unfortunately one of the guides didn’t show up, but the two guides we did have were great. Being one down just meant we wouldn’t be able to climb as much since only the guides were belaying. We walked down the trail a little ways to Slateford Creek/Falls and started getting ready to go. It was in the single digits when we started, and never got above freezing, so standing around in the shade on ice all day was very, very, very cold. I brought a few packs of chemical hand and foot warmers, and my hands did okay but my feet were still frozen. One guide did a little instruction and got everyone outfitted with helmets, harnesses, crampons, and axes. The other guide set up two routes for us to climb, one vertical and difficult and one a little more slanted and easy. I did the easy one first and although I never felt like I was really getting the front points of my crampons in enough, because of the angle of the climb, I still got a good grip. I expected the vertical climb to be difficult and it was even more so than I expected. 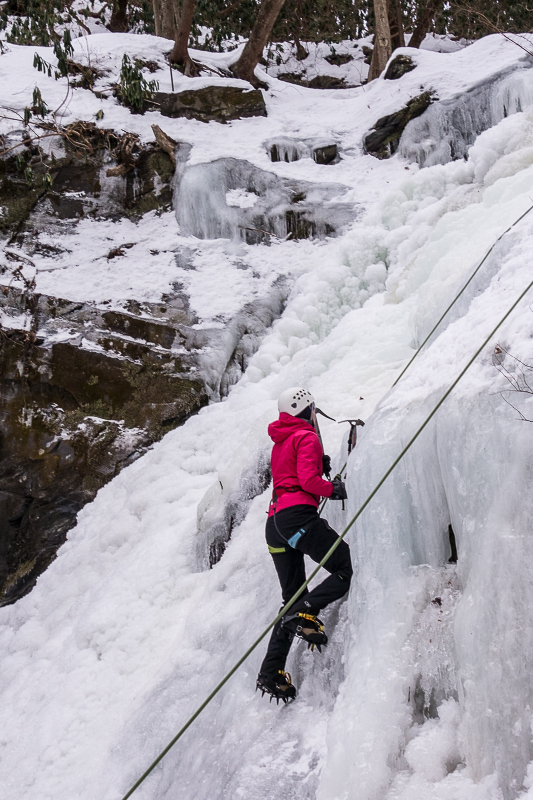 We were using crampons made for all around mountaineering/climbing activities, instead of specialized for just climbing, so the front points were curved down instead of straight out and that made it hard to get good foot holds. Having my wrists harnessed in to the axes made my arms tire very easily too since I couldn’t shake them out as much as during regular rock climbing. It felt to me like I took forever to get to the top of the route but I don’t think I took any longer than most people. 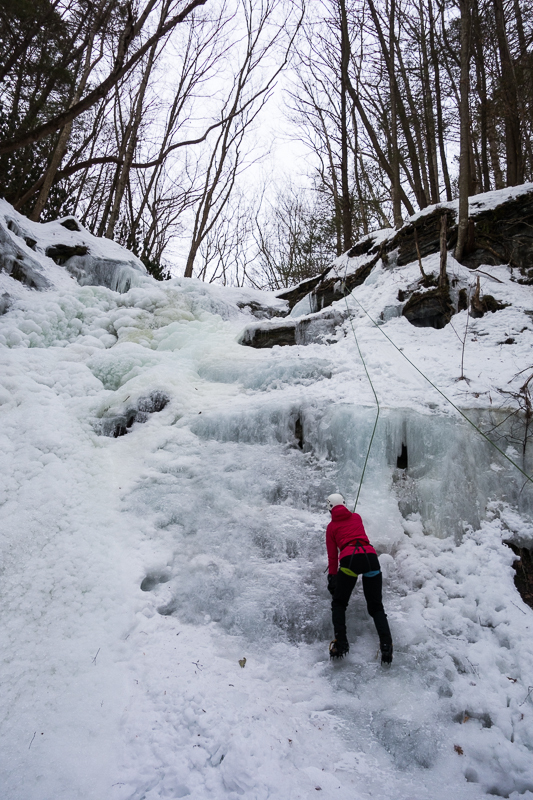 Climbing ice is definitely way different from regular climbing. I did the easy route once more before leaving and it was even easier after the vertical route. 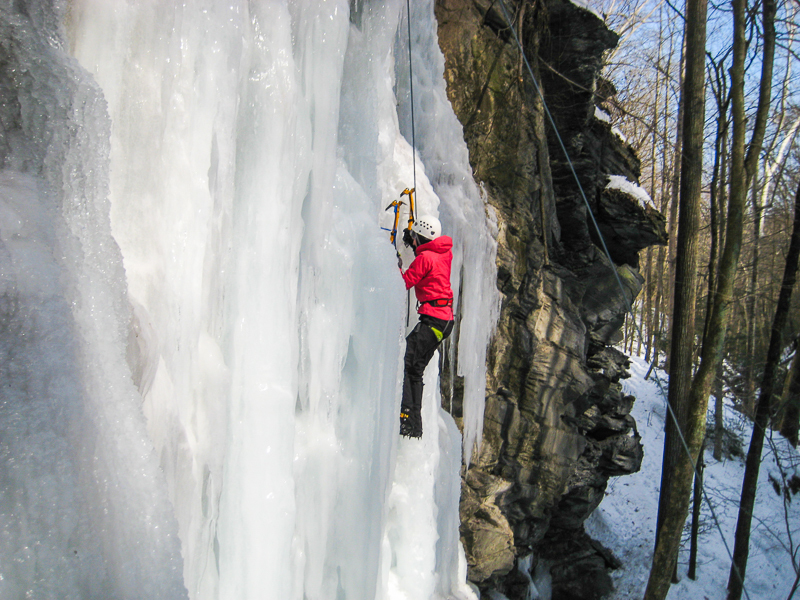 I think I’m going to stick with rock climbing for now, but ice climbing was another great winter activity to try! I’ve been trying a lot of new things this winter and it’s been really fun. Way to go! 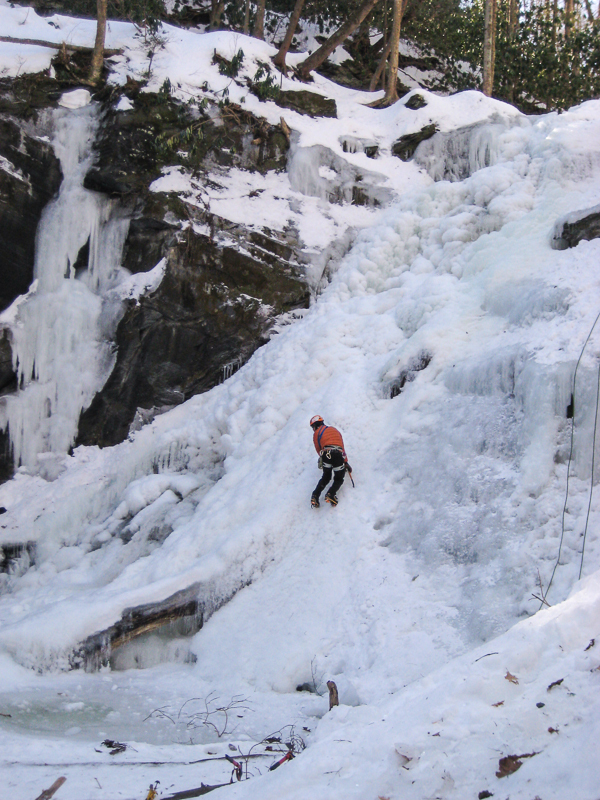 I def want to try ice climbing someday, although I already know I would still prefer rock climbing!